A former Tennessee Department of Correction barber remembers cutting the hair of death row inmates. Reggie Williams, 41, served time for aggravated robbery and was placed at Riverbend Maximum Security Institution in 2001. "They are people too. They're completely restrained. They would come out. They're shackled at the hands, shackled at the feet, shackled at the waist. I believe we should take care of each other. It's the way God would want it," he said. Williams said each Sunday for a year, he would have a list of inmates who wanted a haircut. He believes he cut the hair of David Earl Miller --- now 61 --- who was convicted of killing a mentally ill woman in 1981. Miller is expected to be executed by electrocution. "I'm pretty sure if he got a haircut, I was there, I cut his hair," Williams said. Williams said he never judged the men because he too had trouble with the law. At 19, he was convicted of aggravated robbery and served 11 years. He spent two non-consecutive years at Riverbend. "Their situation might be very severe but I didn't look at it as I was different from them. I was there because of some of the decisions and choices I made that got me in trouble so," he said. Due to good behavior, Williams eventually earned his cosmetology license behind bars. "And then I came out, and I worked as a barber and I saved money and invested in a business so here we are," he said while cutting a client's hair. 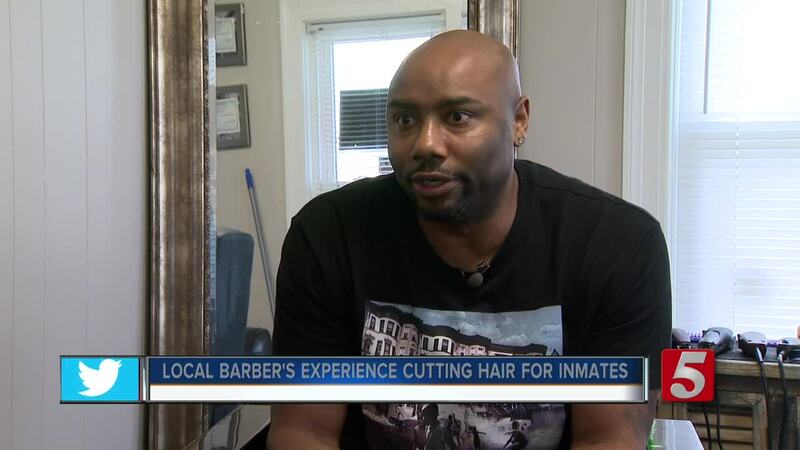 He runs the Headquarters Barber and Beauty Salon on Old Hickory Blvd in Madison. Williams who was fortunate to turn his life around also mentors and encourages teens to stay on the right path.